UK Lotto introduces an easy, bi-weekly lottery game that’s sure to delight lottery novices and veterans alike. It’s a rollover lottery, too—which means you get the chance to really win big if no one wins in the current draw. Plus, like all games under the UK National Lottery, all prizes, regardless of the tier, are paid out in a lump sum and are tax-free. Intrigued? Read on for an in-depth look at UK Lotto! Launched in 1994, what was once known as the Camelot Group-operated UK National Lottery has since undergone many changes throughout the years. One of the most significant is its major rebranding in 2002 due to middling ticket sales, which led to its main game being renamed to Lotto (aka the UK Lotto). More than that, the format of the game also changed several times. In October 2013, for instance, UK Lotto underwent a refresh which saw an increase in ticket prices and the introduction of a millionaire raffle into the mix. Then, in 2015, UK Lotto changed into the form we know today—with the number pool increasing from a total of 49 to 59. Bi-Weekly Draws: UK Lotto draws are held twice a week, every Wednesdays and Saturdays. A Rollover Lottery: When no one wins on a drawing, the jackpot will simply roll over to the next draw, allowing the jackpot to grow even more. Rollovers, however, are capped at £22 million. No Annuity Payout Option: All games under the UK National Lottery, which UK Lotto is a part of, doesn’t offer an annuity payout option to winners. Instead, all prizes are given out as a lump sum. Tax-Free: All prizes won in UK Lotto are tax-free. Though if you entered online via a lottery site, you may still have to contend with local tax laws, depending on where you live. How Does UK Lotto Work? UK Lotto is a very simple lottery game, which is great for newcomers. You simply pick six numbers from a pool consisting of 1 to 59, and you win the jackpot by matching all 6. Wednesday draws usually offer a £2 million prize, while Saturday draws usually offer prizes that range from £3.8 to £4 million. To win the second-tier prize you have to match 5 numbers and 1 bonus ball. To be clear, you don’t really pick another number in addition to the 6 you chose. If you, say, pick the numbers 6, 7, 8, 9, 11 but the winning numbers are 6, 7, 8, 9, 10 with a bonus ball of 11, you win the second-tier prize. Of course, you can also win by matching less numbers, just like in other lotteries. You can win by simply matching 5 or 4 of your numbers, for instance. Unlike some lotteries, however, you must match at least 3 of your numbers to win any money, while you need to match 2 numbers to net a free £2 entry. Meanwhile, if no one wins the jackpot for a particular draw, then it simply rolls over to the next. It will keep doing so until somebody wins, or until the £22 million rollover cap has been reached. Once it hits the ceiling, it can only rollover over once more. The difference this time is that when no one still wins the jackpot during the last rollover draw, the winners of the next prize tier will share the entire jackpot amount amongst themselves. Another difference? During the final rollover draw, the total prize fund could exceed £22 million due to the most recent ticket sales also being accounted for. In other words, if you only managed to match 5 numbers, you could, in theory, win upwards of £22 million if no one wins the jackpot. Every game under the UK National Lottery pays out winnings as a lump sum, which means you won’t get to choose to be paid out in an annuity. All prizes are also tax-free, but that may differ if you chose to enter the lottery via an online lottery agent. To be clear, it will still be tax-free at the source, but—depending on where you live in the world—your local tax laws may apply. Meanwhile, if you win—along with other players—the jackpot, it will be equally shared amongst you, just like in almost every lottery out there. Winners have a total of 180 days after the draw, up until 11pm UK time, to come forward and claim their prize. Failure to do so will results in the money—along with any accumulated interest—being funneled into a fund used for good causes. On May 24, 2017, the £25.5 million jackpot—which was on its final rollover period—wasn’t won by someone matching all 6 numbers. 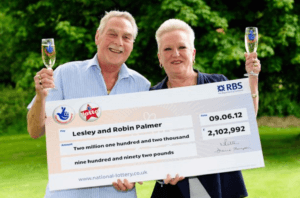 Instead, two individuals, whose tickets matched 5 of the numbers and the bonus ball, received a cool £12,759,916 each. The National Lottery, which UK Lotto is a part of, has raised approximately over £30 billion in funds to be used for charity and other good causes in the UK and abroad. 50% of the lottery fund goes to the prizes, while 28% of it is funneled into the National Lottery Good Causes foundation which—you guessed it—uses the money to aid various organizations and charities. The draw machines all have names! Amusingly, some of them go by names inspired by the Arthurian legends: Arthur, Merlin, Guinevere, Lancelot, Galahad, and Vyvyan. Later on, more machines were added: Amethyst, Garnet, Opal, Pearl, Moonstone, Sapphire and Topaz. UK Lotto may not be as popular—nor as big—as Euromillions, but it’s no slouch, either. It’s a simple, easy to learn, bi-weekly lottery game. Not only do players get the chance to win twice a week, there’s also a chance to win big due to rollovers. Even better, all prizes are tax-free and paid out as a lump sum. As for the odds of winning? They are much, much better compared to bigger lotteries out there—Euromilions included. Plus, it’s also good to know that with every ticket purchase, as with any game under the UK National Lottery, you are indirectly helping fund a variety of good causes.